When it comes to government money printing and central market planning, that’s a good question. It’s obviously not a new one. But it is one that matters more and more when you go from a “globally synchronized recovery” into Global #GrowthSlowing. Again, more good questions, especially if your timing is right. Most “credit” analysts on Wall Street who are a decade or more younger than me haven’t seen a credit cycle in their boss’ book yet, don’t forget. That’s not a knock or stereotype – that’s just a cyclical fact. Will there ever be a Credit Cycle (spreads blowing out) again? Of course there will be. As most things “risk on” on Wall Street go, at first it will start to happen slowly, then it will happen all at once. On A), anyone with an 11th grade education (who wasn’t bearish on US Growth for the last 1-2 years) can readily show you the 8 consecutive quarters of economic growth accelerating. On B), The Shanghai Accord, is now 2.5 years old and it warrants a refresher. 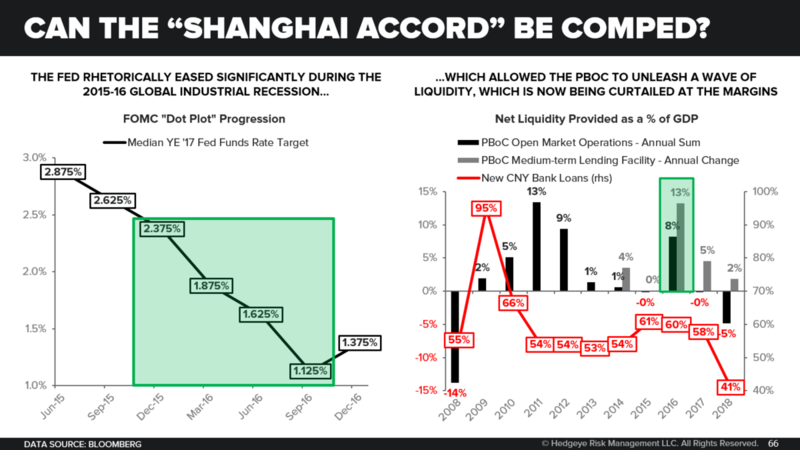 Did the largest central market planning event in Chinese history matter to the subsequent “globally synchronized recovery?” Uh… yes. Big time. And that, my data-dependent-rate-of-change friends, is why we have #GlobalDivergences (slowing) in 2018. Are going to be the hardest economic growth comparisons to lap since 2007-2008. That’s one of the main reasons why I’ve started to make all of the pivots I’ve been making from both an asset allocation and sub-sector exposure perspective. 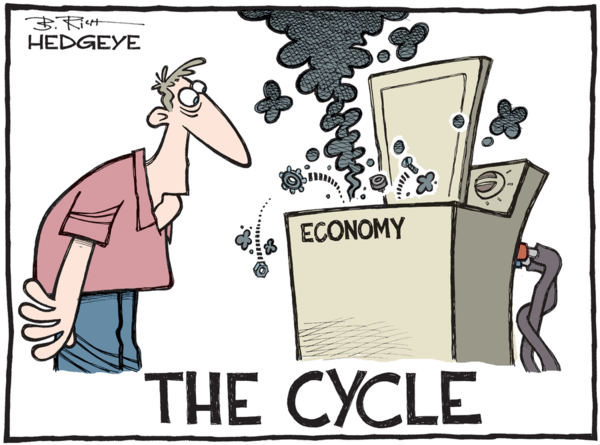 I don’t get paid to miss the economic cycle rolling over from its cycle peak. A: I don’t know, but what if whatever they do can’t comp the comps? What I do know is that I have the unalienable freedom to change my mind if either the economic data or my market signals change. And the real-time update on that is that they haven’t. Despite the Chinese panicking (devaluing the Yuan by 4% doesn’t just happen), the Chinese stock market moved right back into #crash mode this morning, dropping another -1.8% to -21% since it peaked when “globally synchronized recovery” expectations did in January. China, Asia Still Slowing: Q: What do you get when Chinese policymakers openly freak out about their ongoing growth slowdown? A: A largely ineffective easing of monetary and fiscal policy – for now at least. Specifically, China’s JUL PMI data showed ongoing sequential and trending deceleration across the Manufacturing, Services and Composite readings and is confirming of our view that the Chinese economic impulse is likely to remain negative throughout 2H18E. We’re seeing that negative impulse continue to weigh on Asian economic growth, with South Korean Industrial Production growth turning negative in JUN (-0.4% YoY) and its AUG Manufacturing and Non-Manufacturing Business Sentiment slowing to new lows, levels last seen since the start of 2017. All told, we are keen to reiterate our view that until the #OldChina economy laps peak comparative base effects in the 3Q18E-1Q19E timeframe, it is likely to remain a drag on global growth – though perhaps a slightly less of a drag to the extent the recent spate of policy easing kicks in, at the margins. A drag is still a drag, however, and no one is long of global Industrials on that [weak] thesis. Yeah, Double D, tell me what you really think. This actual economic rate-of-change news was published nowhere in mainstream media yesterday. Thank goodness for that. Having an information edge in a world loaded with political spin has never been so valuable.